Chef Roro shares Valentine's Day recipes for a four-course Italian meal that’s romantic and delicious — and won’t derail your nutrition goals. Planning your perfect Valentine’s Day date? 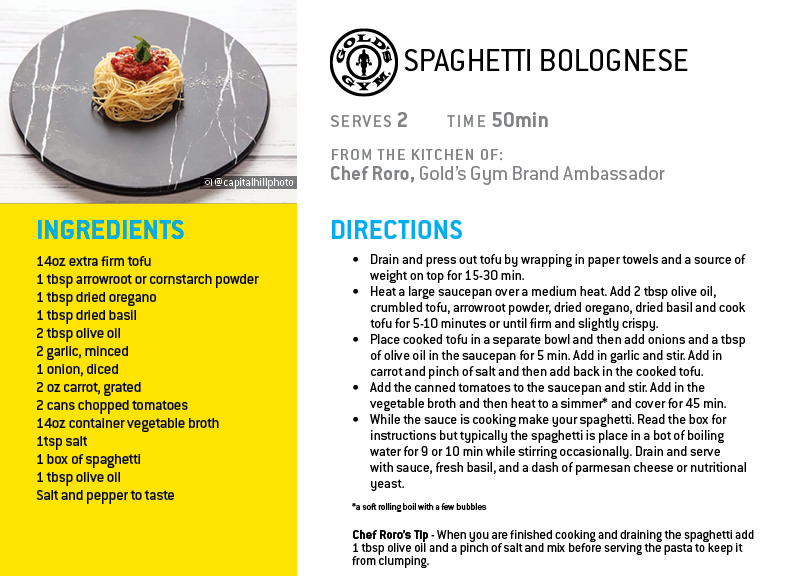 Learn how to prepare these healthy Valentine’s Day recipes from Chef Roro, Gold’s Gym Brand Ambassador and owner of Roro’s Modern Lebanese in Washington, D.C.
With four courses — a bruschetta appetizer, salad, pasta entrée and chocolate-covered dessert — what’s not to love? Set your oven to 450 °F. Diagonally slice the French bread (or any similar Italian bread) to ¼-½ inch size, and brush one side of each piece of bread with the extra ¼ cup of olive oil you set aside. Set the bread on a baking tray olive oil side down. 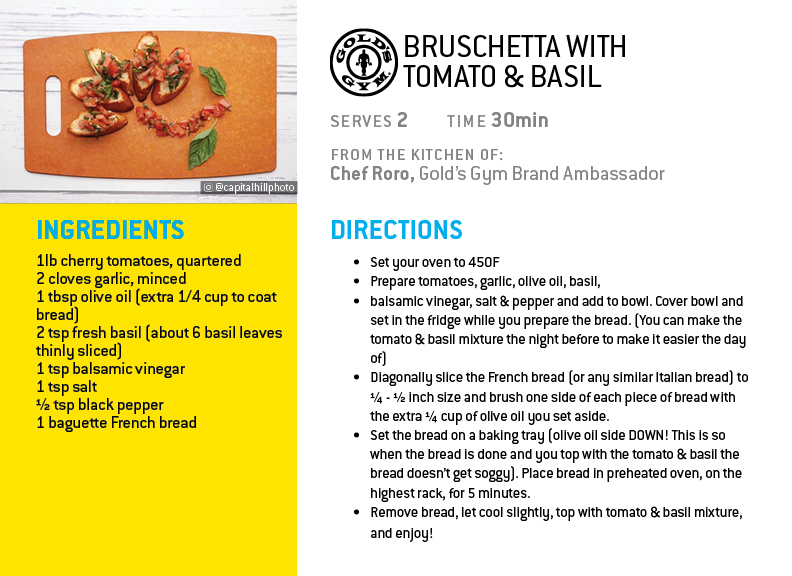 (When the bread is done, and you top with the tomato and basil, baking this way will prevent it from getting soggy). Place bread in preheated oven, on the highest rack, for 5 minutes. Remove bread, let cool slightly, top with tomato and basil mixture. Set oven to 400 °F. In a large bowl, add kale, nutritional yeast, tahini, lemon juice, soy sauce, maple syrup, salt, and pepper. Mix together and set aside. In a separate bowl, mix chickpeas and olive oil. Lay mixture on a lined pan and place in the oven for 10-15 minutes. When chickpeas are crispy and done, remove from oven and add garlic, onion powder, dried oregano, and basil, mixing evenly. 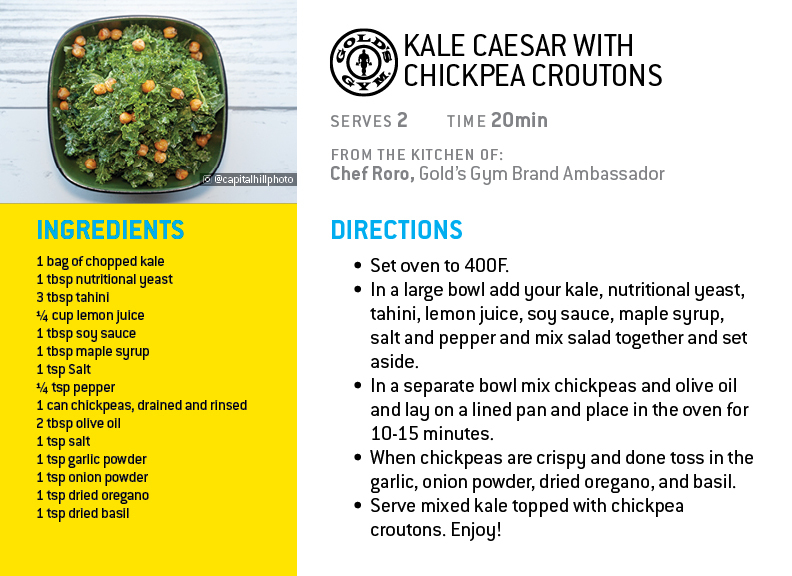 Serve mixed kale topped with chickpea croutons. Drain and press out tofu by wrapping in paper towels and place a weight source on top for 15-30 min. Heat a large saucepan over medium heat. Add 2 tbsp olive oil, crumbled tofu, arrowroot powder, dried oregano, dried basil and cook tofu for 5-10 minutes or until firm and slightly crispy. Place cooked tofu in a separate bowl. Add onions and a tbsp of olive oil in the saucepan for 5 min. Add in garlic and stir. Add carrot, a pinch of salt, and then re-add the cooked tofu and stir. Add the canned tomatoes and vegetable broth and stir. Heat to a simmer and cover for 45 min. While the sauce is cooking, make your spaghetti. Read the box for instructions, but typically the spaghetti is placed in a bot of boiling water for 9 or 10 min, stirring occasionally. Drain the spaghetti and serve with sauce, fresh basil, and a dash of Parmesan cheese or nutritional yeast. Chef Roro’s tip: Finally, when you are finished cooking and draining the spaghetti, add 1 tbsp olive oil and a pinch of salt, and mix before serving the pasta to keep it from clumping. Fill a medium sized pot halfway with water, and set on the stove on medium-high heat. Get a glass bowl that will sit on top of the pan on the stove so that the bottom doesn’t touch the water in the pot. Fill the glass bowl with dark chocolate and coconut oil, and mix until it melts completely. When the chocolate is melted, take a strawberry and insert a toothpick or wooden kabob skewer halfway into the leafy top side of the strawberry. 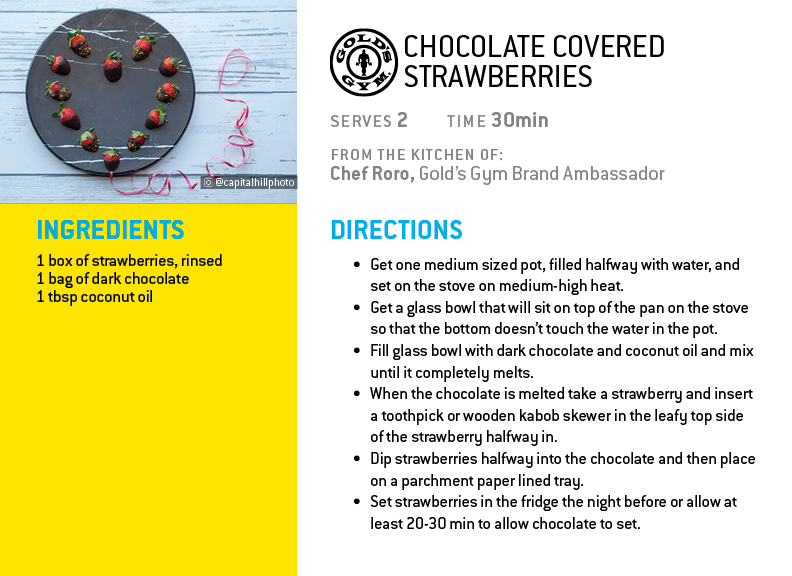 Dip strawberries halfway into the chocolate and then place on a parchment paper lined tray. Set strawberries in the fridge the night before or allow at least 20-30 min to allow chocolate to set. Be sure to follow Chef Roro on Instagram.